Feeling like the little fan boy that I essentially am at heart, I entered the back stage area in Vega, super excited over the chance of meeting and asking questions from one of my favorite bands, Rise Against. I was expecting more or less the entire Danish media present, but only found fellow online mag Revolution Music, and a student radio station XFM waiting for their turn with the boys. I guess it speaks volumes about which magazines cover good music in Denmark and which don't - apparently Soundvenue and Gaffa had shown no interest to the label about covering a sold out show at Vega. Such a shame but I guess that really proves bassist Joe's point later on in the interview about Rise Against still being definitely punk and feeling out of place in the mainstream. 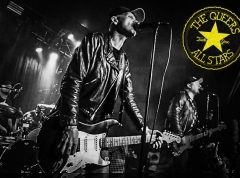 We sat together for over twenty minutes covering everything from the band's straight edge ideals and politics through the mass singalongs at Groezrock to their disbelief about headlining in front of one of their biggest influences, Rancid. It's a good read, enjoy. RF.net: Thanks for doing this interview, first of all. If you could just start by introducing yourself and telling us what's new in Rise Against for now? Joe: Actually what's new is on this European tour, we actually hit Russia and Scandinavia for the first time. We've been a band for ten years so we apologize it has taken us this long to come to Denmark. We played Sweden last night...so that's definitely new for us. New territory. RF.net: How was the show in Sweden? Joe: It was awesome. It was really good, and one of my favorite bands opened up, Regulations, they're from Sweden. They're from Umeå, and they're amazing. They sound just like punk rock from 1981, so that was really cool. RF.net: What about tonight's opening band, The 20Belows, have you had a chance to check them out? Joe: I don't know much about them, so I'm looking forward to checking it out though. RF.net: They're quite good. So you guys put out "Appeal To Reason" last year, what do you think about it today? Joe: Oh, it's my favorite record that we've done. I think with every record, we just get better songwriting. We grow us people and as songwriters, and as a band really, together. But I feel that we're on the same page, which is a lot to say after been a band for ten years, that we all still have the same goals in mind. So that's why I think it works so well together and that's why I think "Appeal To Reason" came together so easy. We're all in agreement musically and ethically. RF.net: Yeah, you guys are a full-on straight edge/vegan band. What does that mean to you? Joe: Our drummer is not straight edge, he drinks, and we're vegetarian and not vegan. But I think we all became vegetarian at different times. I've been vegetarian for probably nine years now. I think we all went vegetarian for the same reason. We think the meat industry is pretty fucked up. It's bad for the environment, you know? Just the amount of land they use for cows just like in graze and pastures, they're ruining land doing that, the methane gas, all that stuff is just bad for the environment. Not to mention just the treatment of the animals as well. So that's why we're vegetarian. Because when I was in high school, I actually worked in a butcher shop, before I was vegetarian, and it's awful. They don't care! Things drop on the floor, they pick it up, they just package it, they don't care. Joe: It's a very horrible industry. I guess there are just many facets to it that are awful, so. RF.net: Actually I'm just gonna pop in an extra awkward question here, but back in the day when you weren't vegetarian, you must have been eating meats and everything, but do you miss it at all, the taste or anything? Joe: Not at all, because for whatever I would miss, there's a vegetarian substitute now. It's 2009, so you can find an alternative for any kind of meat now that's vegetarian. And now that we know what goes into the meat industry it's like.... I can't. It's gross to me. RF.net: Sure. "Appeal To Reason" had that one song called "Hero Of War", I know that was mostly Tim's song, but still, that was quite a personal song. Do you know how that song came about? Joe: Yeah, Tim saw a documentary called the "Ground Truth" while we were recording, and I actually saw it since he saw it as well. They interview three soldiers about what their life's like when they came back from the war, what it was like there, and that's what that song's about. It's their stories. It's a very ugly side of war and what war can do to a person. It changes you, it makes it ugly. So that's what that song's about. A lot of people took it as like anti-American and anti-troops. Not the case at all, it's more like symphatizing with these kids who go over there who are 18 or 19 years old, I mean that's a lot to take in. When I was 18 I could barely handle getting broken up with my girlfriend or something, so it's pretty messed up. So that's why Tim felt the need to tell the stories of these people, you know? RF.net: Right. And in general it's not wrong to say that Rise Against is a quite political band, what does that mean to you? Joe: It's not just strictly one thing. I think we're socially aware, that's what I like to say. But Tim, he writes about relationships, politics, environment, environmental issues. I think if you write about one thing you pigeonhole yourself and you limit yourself. I love bands like Anti-Flag, but it seems... for us, I think we would get very, or we'd feel very closed off, where you kind of gotta break outside the box a little bit, you know? RF.net: I know you already mentioned that "Appeal The Reason" is your favorite Rise Against record, but if we discount the newest record, because that's what every band says right? Joe: I like "Revolutions Per Minute". Only because I like it for nostalgic reasons. I like it for....I feel like it was our first record where we really started to find our sound. It was the first record where Tim and I started writing together. I wrote all of the first record, and I really feel like we worked well together musically. And some of my favorite songs are on that record. Just like "Black Mask & Gasoline", we've been playing "Blood Red White & Blue" in our set. It's just fun, it's a very energetic record. RF.net: Only those couple of songs though, you guys don't really play that many old songs, there's nothing really from the first one, for example? Joe: No but you know what, we just toured with Rancid in the states, and we tried to play a song off every record. It's hard, because if you play a song off the first record, then what do you kick off that's newer out of the set? If you add something, one has to go. It's tough, it's very tough. RF.net: I guess we kind of touched on this question already, but how do you view your old albums today? Joe: I'm really proud of every record. My only regret is that I wish our first record would've been recorded better. We went to a friend of ours and it wasn't really his style, I think that we lost the power, the energy behind those songs with the recording. I wish we would've went to Bill Stevenson who did "Revolutions Per Minute". That's my only regret. RF.net: Well in my opinion, you guys still haven't put out a single bad record yet, and in fact I'd go as far as saying that Rise Against is our generation's Bad Religion. What do you think about that? Joe: I've heard people say that, I'm totally honored, because Bad Religion is my favorite band ever. We toured with them five years ago, but I watched them every night and never got sick of it. It's a total honor though, because I think without Bad Religion, we wouldn't sound the way we do. So I think that was one thing I brought to the band, that style. Because songs like "Collapse" and "Chamber The Cartridge", that's like my style of writing. It's great to bring that energy, especially now when it's 2009 and not a lot bands are doing that. RF.net: Exactly! It's a shame. If we take a look at your discography as a whole, starting from the first album. In my opinion there's a tendency that every album introduces a slightly louder pop element to the mix. Not in the sense of pop like what we hear in radio, but the songs are catchier and you're getting more fans in the process. Do you think that you're gonna continue this same trend in the next albums, are you gonna write more, say, softer punk rock, or are we gonna see Rise Against write another pedal-to-the-floor punk rock record? Joe: You know, I don't know! Because we don't write a one specific time period. Like Tim & I will write on our own throughout the year and whatever we feel at the time. Such as "Appeal To Reason", that's just what came out of us last year, or two years ago when we were writing it. But then we just put out that 7" on Fat Records and those songs are definitely older sounding, and we wrote those the same time. So just whatever we're feeling at the time. RF.net: Yeah that one was like you lost a bet to Fat Mike right? Joe: [laughs] well that was a joke, we didn't really lose a bet, but we liked those songs but they didn't really fit on "Appeal To Reason", so we talked to Fat Mike and we thought it'd be cool to do something on Fat Records again. Luckily our label let us do it. But yeah those songs are fun, we haven't played them live yet, but I'd like to. RF.net: Would that many people would know them though? They're only on vinyl, right, or I don't know if you can buy them digitally as well? Joe: You can buy "Grammatizator", well you can buy it on iTunes in the states, I don't know if it's in iTunes over here. I think it might be, because iTunes started doing digital LPs and digital 45s, so it's a digital 45 with a live version of "Hero Of War". RF.net: So you guys are on a major label, have been for a while, you have songs and videos on MTV. How connected do you feel to the term punk rock today with that in mind? Joe: Well I still feel very connected because that's our lifestyle and those are our ethics. I think that somehow submerged in that atmosphere, we're mainstream, you know, we play like a radio festival and we still don't fit in with any band. I still feel very disconnected from that world even though we're part of it. It's kind of weird. Songs like "Audience of One" are definitely more pop, but I think the heart of the band is still punk rock. But it is strange, you know? We'll play a festival with Coldplay or something, and it's kind of like "what are we doing here? ", but somehow fans like us. Their fans like us, it's weird. So it is a bit strange but I still feel very much rooted in punk rock. RF.net: Sure. I saw you guys at Groezrock earlier this year, in April. I just remember being there, and there were 15,000 people, and then you guys played "Give It All" and the place exploded, so I just wanted to hear, what did it feel like being on stage at that moment? Joe: Crazy! We started playing Groezrock in 2003, and I can't believe that every year we play it just gets bigger and bigger for us, and that was kind of like...I was really blown away. Just jaw dropped [huge grin on face]. I'll never get used to those moments. It's great, you're not wanna go away! RF.net: Yeah I remember being there and I was also blown away because I didn't expect THAT big of a sing along, and it was also difficult to get into the tent! Joe: Yeah, when we started playing the festival, Bad Religion was headlining and Sick Of It All was headlining, so to be in that slot now... I think we played right before NOFX, and just to be up there with our influences is just crazy. RF.net: It's really interesting actually because right after you guys played, half the people who were there left, and they didn't see NOFX. Apparently you guys are more relevant to today's kids I guess than NOFX. Joe: [laughs] Yeah it's a bit strange. NOFX and other bands that without... I play bass obviously and without Mike's bass playing...it's like I learned how to play bass playing along with "Ribbed" and "White Trash, Two Heebs & A Bean", Bad Religion records and Descendents records, so I hope our kids would've stuck around for them! RF.net: So thinking about that again, would you say that Rise Against has 'made it' as a band? Joe: I guess so, I mean, it's kind of hard to... it's weird to realize, I guess, but I think I kind of realized we have accomplished as much as we have when Rancid was touring with us and they were playing before us. And that was just crazy! And they were just glad to be there and we got along with them really well. Matt's one of my favorite bass players, you know? Joe: Yeah, he's great. We hung out with them every day and he was just like... I don't know, it was a very surreal experience. And I hope that one day if our popularity starts to wean a little bit, a younger band would take us out, and do us the same salute that we did. I mean Rancid's still very relevant, and I was thinking that their fans are gonna leave, but they didn't, and the shows were crazy, massive, so it was really cool. 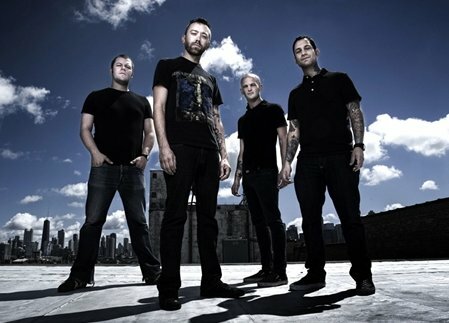 RF.net: So what you say is the number one best thing about being in Rise Against now, and the number one thing that you miss from being in the band in the old days? Joe: Well I think that I really miss the DIY factor about it, and I do miss the smaller venues because you can't touch that energy. No barricade. Tonight is one of the smaller shows on this tour, and it's still a pretty big room. I just saw 7 Seconds play in Chicago, and there was 200 people there, and I felt like a little kid again. I miss that feeling, just the interacting with the band. But at the same time, I'm 34, I have a family, and I'm very grateful that we can do this as a living. I mean our hearts, we're very sincere about what we do, we love it. I think we're just very lucky to do that, not many bands can do that. RF.net: I really think it comes across on your records, that honesty, and I think that's why a lot of people like you guys, because it's very honest and also good music, so it comes across well even in a country like Denmark where people mostly listen to indie rock. There's almost no punk scene here, and then you guys sell this place out, I was kind of blown away. Joe: Really? Wow. I didn't know too much about the local punk scene so I was wondering how it'd be. RF.net: The 20Belows is Denmark's biggest punk band, and I saw them the other week in a place where there were maybe 50 people there. Joe: Wow. Is that band Gorilla Angreb from here? I wonder if they're more like underground...I think they're Danish, but I was just curious. RF.net: Not sure actually. What is your opinion on today's music scene? Joe: I think there's a resurgence of aggressive punk rock at least more in the underground scene, in Chicago at least. I think it's a bit weird though because I think that bands that start now... most of these bands seem to have the mentality that they're gonna be huge right away, they get signed off Myspace or Facebook or whatever, and I don't think that's the way to go about it. I think you have to pay your dues and that way you'll appreciate what you have. We toured in a van up until "The Sufferer & The Witness". People think that when you sign to a major label you get a bus, you get that, but we didn't want that. We wanted to be smart about it. And I think that's missing in today's music scene. I guess it's what we were talking about earlier, the sincerity is gone. That's why bands like...the Swedish band regulations, they have that fire. You can tell they're doing it just for the music. And I miss that. We play radio festivals and it's like, you know if the band you see is going to be around for one more year and then they're done or the band that's gonna be around for five or ten years, and there are definitely fewer and fewer bands that are gonna be around. It's just weird that happens. RF.net: So you touched the Chicago music scene there, so I was just gonna ask about Fall Out Boy. They're also from Chicago, what do you think about them? They're from what you would call the poppy end of punk. Very poppy. Joe: Definitely. I mean, we're friends with them, and I don't know. I just think they took a different road, they kind of went all out to really succeed in the mainstream world, whereas we just wanted to write good songs that we liked. And it just so happened that a broader audience started liking them. So I think that's the difference. I don't ever knock what they do, but it's not really our thing, you know? RF.net: Couple of more questions left. What are some of the pros and cons of touring across the world? Joe: The pros are the fact that we can play here and it's sold out. The fact that we played Moscow in front of 2000 people, that just blows my mind. We've been a band for 10 years and the crowd attendance never ceases to amaze me. I'm not sure if it's like that, well I guess you said it's not normally like this where a punk rock band will sell this place out. I'll never get used to that. But the con for touring is missing our families. It's definitely tough, I have a son now and he's only 9 months old, and it's really hard. My wife will send me pictures or video or something. We all have families, that's definitely the most difficult part. RF.net: Last question. I've read that after you guys finish this tour and the Australian tour, you'll put out another album, or write another album? Joe: Yeah we're gonna take some time off and then start thinking about the next record. RF.net: You haven't written anything yet? Joe: No but Tim and I always have new ideas floating around. At sound check we kind of messed around with new ideas, but nothing like... I think I have maybe like two full new songs, but I haven't really put my mind to it yet. RF.net: Sure. Well I have no more questions, thanks for your time, do you want to say anything else to the readers and the fans? Joe: Well thanks very much for the sold out show here, we definitely weren't expecting that, so we're excited to play!